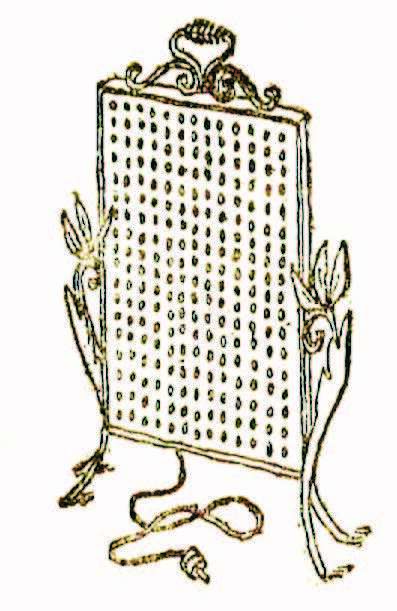 The invention of sheathed heating elements comprising a metal tube swaged around a coiled heating wire, and which is insulated by compressed magnesia, was an essential step of the electrothermics development. Thanks to their mechanical strength, impermeability and resistance to corrosion, these are the most professional heating technical solutions. 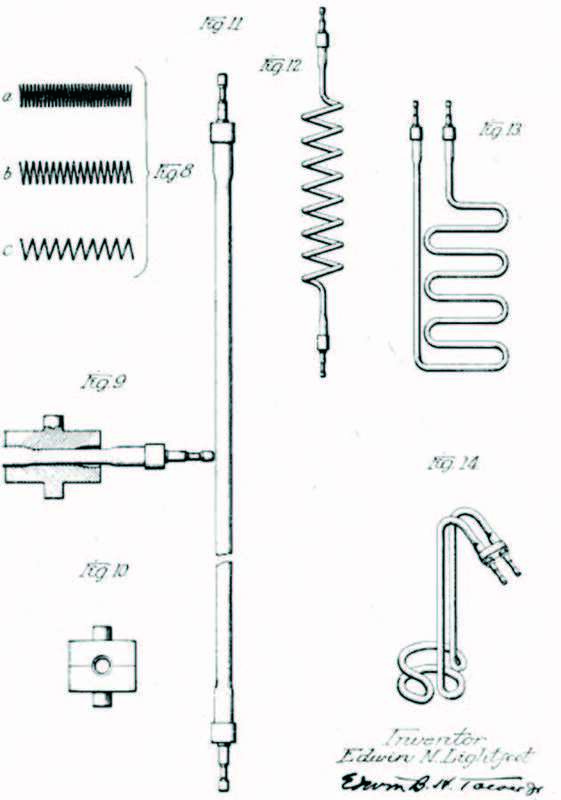 The appearance of these heating elements, now universally used, was the result of a combination of different advanced techniques of the early 20th Century. Over the last two decades of the 19th Century, the emergence of electric heating had revealed the need to find reliable solutions for converting electricity into heat. The first electrical heaters were platinum wires (inherited laboratory equipment), nickel silver or even iron. Research carried on resistive elements with greater resistivity and good temperature resistance. On October 12, 1878, St. George Lane Fox-Pitt filed patent in England 4043, in which he developed the use of electricity for lighting and heating. This patent, based on the use of platinum filaments, was not followed for heating but it was the basis for the development of electric bulbs. 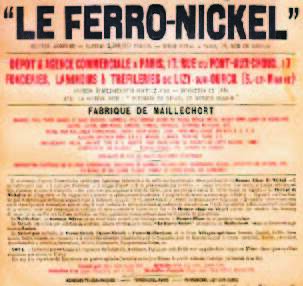 In 1884, French Henri Marbeau, a pioneer in the manufacture of Nickel in New Caledonia and France, founded the company “Le Ferro-Nickel” in Lizy sur Ourcq”. He became the first to obtain sufficiently pure alloys of iron and nickel, which nickel content was mastered, to be used as heating wires. These alloys (patented in 1884 and 1888) with different proportions of nickel were set forth at the Paris Exhibition of 1889. Their temperature resistance and resistivity were incommensurate with wires used previously. Between 1888 and 1890, the exponential growth of incandescent lamps, which carbon filament supports are made of platinum causes the tripling of the price of this material in 2 years, from 900 to 2,750 francs per kg, which made it too expensive for heating applications. Ironically, carbon, rapidly dropped for incandescent lamps, now returns in the form of braided fibers in the quartz tube heating elements radiating in the shortwave infrared. From 1890, heating wires embedded in an asbestos board were used for irons (Carpenter, USA). 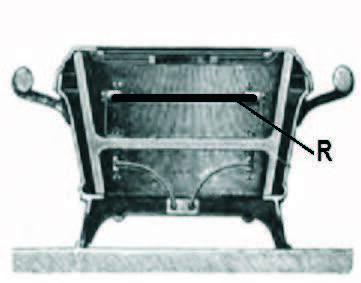 The electric furnace set forth in 1891 by the Austrian Friedrich Wilhelm Jenny Schindler still uses platinum heating wires embedded in an insulating enamel. It will be presented at the Chicago World’s Fair in 1893. In 1891, the English manufacturer R.E.B. Crompton presents at the London Exhibition at the Crystal Palace, a frying pan and other electrical heating devices (which will be shown in a catalog in 1894 “Domestic Electric Machinery, Electrical Heating and Cooking Electrical Apparatus”) in which the heating element is a copper zigzag wire embedded in the enamel forming the bottom of the pan. It quickly turned out that the heating wires broke quickly because the expansion coefficient of the enamel was lower than that of the metal plate it was layed on. In the same year, a similar solution used by the Carpenter Electric Company (St. Paul, Minesotta) on electric kettles experienced the same troubles. At the same time in Switzerland, the company Grimm & Co. develops a similar range of products under license from the Austrian Schindler-Jenny and Stuz, which will be presented at the Chicago Exposition in 1893. The maximum temperature reached is 250°C then, because it is limited by the performance of insulating enamels. already available. Heating wires used to be made of galvanized steel or nickel silver also called “German silver”. The technique of enameled heating wire is applied in France for the first electrical appliances of the Familistère de Guise (Dequenne), presented in their 1897 catalog, under Crompton license, at the Universal Exhibition of 1900, which uses nickel silver wires and then ferronickel wires. The enamel technology has evolved and breakages are less common. 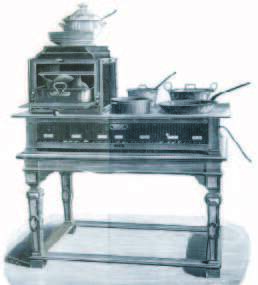 From 1899, the French company ”ParvilléeFrères et Cie” patented and manufacturedhigh-power heating elements made of metalceramic sintered (nickel, quartz and kaolinbase), running red outdoors, paving the wayfor the first electric heating and cookingprofessional devices, shown in operation inthe La Feria restaurant at the Universal Exhibition of Paris in 1900. These elements may be considered as theancestors of the heating elements made ofsilicon carbide, currently used in industrial furnaces. 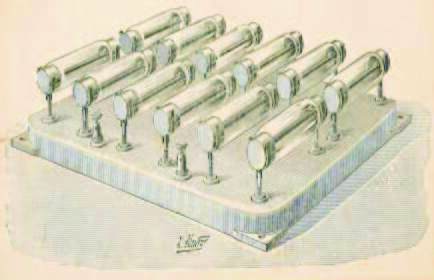 In 1898, the French Le Roy used a 100 x 10 x 3 mm ” graphitoïde silicon ” bar surrounded by a glass envelope in which there is vacuum, as a heating element, in order to produce 80 watts hot logs. This element resistivity is 230,000 times greater than the nickel silver wire, and withstands 800 ° C. These hot logs will be used for twenty years. heating wires are wound on a ceramic, asbestos or mica core, or sandwiched between two enamel layers. The quick development of domestic appliances (irons, water heaters, room heaters), and the demand for heating wires and better systems tickled manufacturers research, particularly in the USA, which was at the forefront of household electrification. 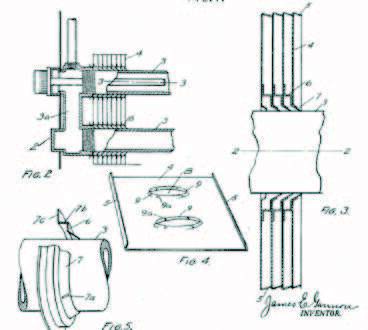 In March 1905, the American engineer Albert Leroy Marsh at Hoskins Manufacturing Co. in Detroit made an important discovery for the heating elements: a 80% nickel and 20% chromium alloy, which is later named Nichrome, which resistivity, corrosion resistance and temperature resistance allow the making of reliable and durable heaters.(U.S. Patent No. 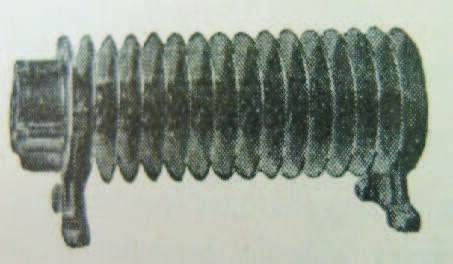 811,859, February 1906).This alloy Nichrome 80/20, with standing continuous 900-1000°C temperatures, essential to radiate in the infrared, allowed to make heating elements incandescent in the air. At this time, no material but platinum which was too expensive, would allow to meet this need. It allowed to make the first electric toaster with bare resistances or in quartz tubes in 1908 (Radiant heaters in quartz tube, patented January 12, 1908 by William SAndrews). These heating elements under radiant quartz tube will be the ancestors of the quartz tubes used in infrared heating and in radiant cooking stoves. In January 1914, Edwin L.Wiegand young Americanengineer filed several patents related to mass production of iron heating elements. For the soles ofirons, he invented heating wires positioned in a”cement or pressed powder” heat conductor. 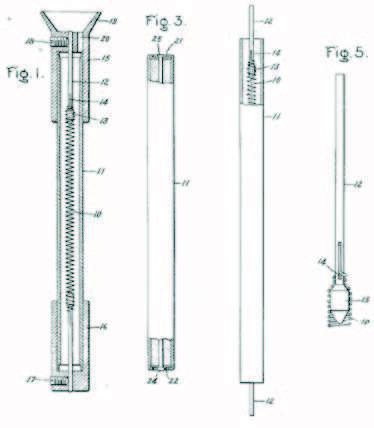 This was the origin of the company Chromalox in Pittsburgh,which then began mass production of these heating elements for irons.On January 3, 1914, he filed, among other things, a patent for a tubular element comprising a straight heating wire, insulated with magnesia (patent US1127374). 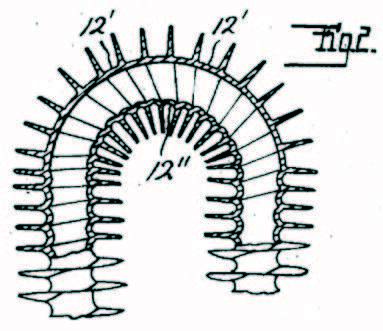 On November 15, 1918, Charles Abbott, Pittsfield, Massachusetts, Engineer for General Electric USA, filed the 1.367341 Patent, where wire wound heating elements surrounded by magnesia are compressed by necking of the tube. 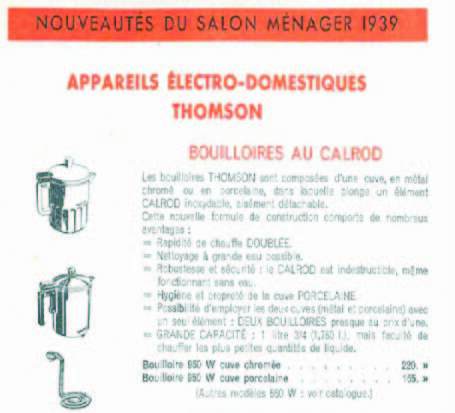 These heating elements will be known under the brand name “Calrod”, also called in France “shielded heating elements” and marketed by Thomson (Als-Thom) around 1930. (Norwegian Patent 37862, U.S. Patent 1,451,755 granted on 17/04/1923, last update 16340). Despite the loss of electrical insulation due to the conversion of hydroxide into oxide in this system (which were offset by subsequent modifications of the method in 1936), these two production systems, Calrod and Backer will compete for decades. 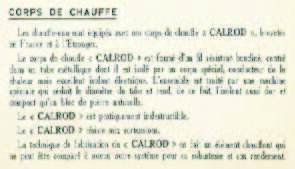 But only the Calrod process has survived, thanks to its simplicity of manufacture as a self evidence. These two systems will allow the production of shielded heating elements with high power densities, which will be limited only by the maximum possible temperature of the internal heating wire and by the tube capacity to exchange its own heat with the external environment. of the high power densities achievable. Therefore, both ways were explored: helical fins on tubes that are then formed or fins crimped on pin shape tubes. transposed to shielded heating elements. 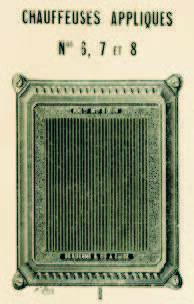 On December 8, 1927 James E.
Gannon, American Electric Heating Company, introduced the first electric heater using rectangular fins crimped onto a shielded hairpin heater element (Patent US1788516 A). powders, of resistive wires, and in the appearance of metal tubes with high heat and corrosion resistances (among other materials: 304, 321, 316 stainless steel and Incolloy 800, 840, 825). Chromium and resistant to corrosion. These wires have now become a standard of high temperature resistance. 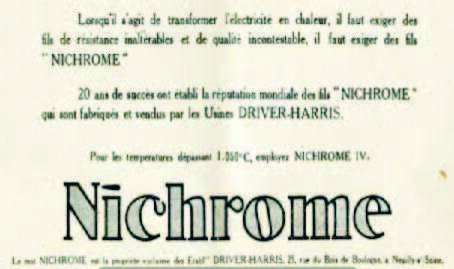 After a period of prohibition to use electricity for heating, imposed in 1941, several manufacturers of shielded elements such as Métanic, Rubanox, Spirox, were born in France from 1945. Technology and research then carried on sealing the ends of the tubes, because the hydrophilic properties of magnesia make it slowly lose its insulating properties. The development of silicone resins (1945-1950) and epoxy resins (1955-1957) greatly improved this critical point. Since that time, there was little change in the concept of manufacturing shielded heating elements and improvements appeared mainly in the quality of raw material, and of new refractory and stainless alloys used for metal tubes and heating wires. The evolution and democratization of devices for making sintered silicon carbide elements, as well as quartz tubes and bars helped make infrared radiant elements with a very high yield.